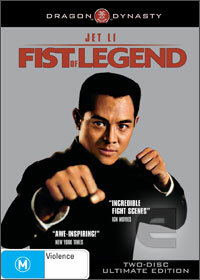 Fist of Fury was one of the definitive films of the legendary martial arts movie star Bruce Lee and it is a relatively unknown fact that Jet Li starred in a remake of this classic film. Jet Li has had recent success in the US, garnering a lot of fans unfamiliar with his earlier work, even though he has been well-known to legions of Chinese fans and martial artist aficionados for decades. Fist of Legend's story will be familiar to Bruce Lee fans. Chen Zhen (Jet Li), while studying in Japan, hastily returns to China after learning that his master Huo Yuan Jia has died. Chen returns to his old school, where he discovers that his old master's son is now the new master and this causes conflict as it is obvious that Chen is a superior fighter in every way. He also learns that Huo died at the hands of a rival dojo master, Akutagawa. While there, Chen pays respect to the old masters shrine and grabs a sign next to it and breaks the sign in two - the sign reads "Tolerance". Chen visits the Akutagawa's dojo and easily defeats all students and the master, using the same martial arts technique as his dead master. This raises suspicions that his old master may have been poisoned and thankfully for us, and turns Chen into a one-man, all conquering revenge machine. Tolerance is a recurring theme in the film, as it is shot to be in Shanghai, around 1937, during Japanese control and a lot of the film centres around intolerance in different ways - the intolerance between the controlling Japanese and the oppressed chinese and also between the general chinese population and Chen's japanese love interest. This is contrasted with many occasions of tolerance and respect towards each other's honour systems and exudes the fact that there are honourable and dishonourable people in all societies. In fact, the subtitles do tone down the nationalistic and racial themes of this film, making it much less powerful than it could be. In reference to the subtitles, with knowledge of cantonese, I was severely disappointed in many instances. 90% of the time, the subtitles were accurate while a lot of the meaning was cut and gilded in slang in 5% of the time. In the remaining 5% , the subtitles had absolutely no relevance to what the people were actually saying - even in one instance, several lines of subtitles appeared on the screen while no one was actually speaking. I do not know if this was an attempt on the subtitlers to improve the movie but it was a very poor attempt at giving the viewers an accurate portrayal of what was being said. The story, in itself is a worthy one, with Chen restoring the honour of the old master Huo Yuan Jia (already a real-life folk hero in China) amongst the backdrop of a chaotic Shanghai under control of a foreign entity. Jet Li is excellent, especially when showing off his martial arts and it is evident why he was already a national Chinese wushu champion at age 17. The fights are choreographed with loads of action and excitement and why shouldn't it be, with the person behind the Matrix's trilogy and Kill Bill fights sequences (Woo ping Yuen) at the helm of Fist of Iron's fights. It makes for one enjoyable film, even for people who are not usually into martial arts films. The DVD has limited options for the main movie, offering a Dolby 2.0 audio track with aforementioned poor english subtitles and a commentary track. On the second disc, there is a plethora of documentaries, deleted scenes and trailers keeping the enthusiasts happy. This homage to Bruce Lee and Fist of Fury is a worthy addition for the action and martial arts movie buffs amongst us.